Over the past few years, millennial pink has come for our beauty products, our wardrobes, our bars, and even our beloved Drake. Recently it’s also begun to besiege our palettes: pink prosecco, pink toast, pink pitaya, and, yes, pink pasta. I thought New York, a city whose residents pride ourselves on our all-black ensembles, would be immune to the pink plight…but I was wrong. For seven days I successfully subsisted solely on rose-colored food and drinks, with only a few rules to guide my journey. Not everything can be dyed in beet juice, but when cooking at home I’m allowed this hack. Salmon and tuna count. Fish can be pink. Strawberry ice cream is cheating. Mostly because this is my favorite thing on earth and I will only eat this for seven days and my immune system will shut down. Tuesday, Day 1: Sugar is awesome. After waking up late, I headed straight into the city for my first meal at the mecca of pink—Pietro NoLita. There the charming owner, Pietro himself, educated me on his relationship to pink, spending summers on the Italian Riviera, and why he chose it as the theme of his restaurant. To him, he explained, pink is a statement, an emotion, and a key part of the environment he wants to create for his business and patrons. It’s a spin that hasn’t been done at a trattoria even though many of his menu items—the pasta in particular—are from his childhood in Milan. Gladly accepting a plate of a simple and delicious lemon broccoli pasta, I did something I never do: have a drink over lunch. It’s pink week–why not? Scarfing down a slice of Good Humor cake (verdict: delicious), and a vegan strawberry cupcake that I’m convinced was made with sorcery, I left with a skip in my step, finished my work for the day, and met up with one of my bests, Carly, to do an 8PM workout. After the gym, I decided I would find some food on my way home. This was a mistake. While sweets may sustain your system, the second I got off my workout and sugar high, I was ravenous and couldn’t make a decision about what to eat. Half-cooked beets and an entire packet of honey cured ham was a low point. Wednesday, Day 2: Sugar crashing is death. 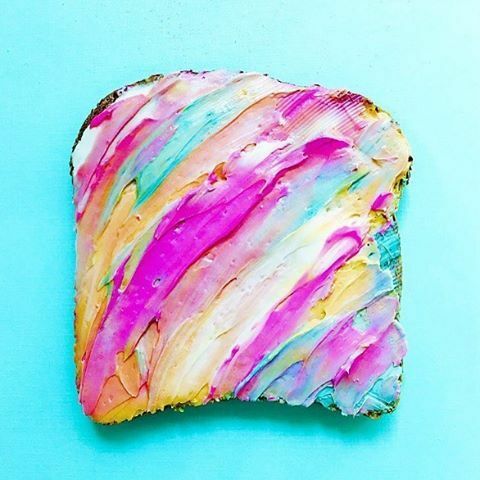 Waking up and not wanting to look at anything resembling cured meats, I decided I would attempt the much-Instagrammed mermaid toast. Grating some beets and ruining three pieces of toast with cream cheese, I ditched the Instagram tutorial and made a quick tahini toast and spread my fresh beet juice on it. It was a thing of beauty. Afterwards I headed to Grassroots with my business partner Marta, where we met the brains behind this healthy Brooklyn hotspot; Sabrina Linette Dîaz served us a perfectly millennial-pink-tinted rose water that I’d like to bathe in, and a B12 Boost Bowl. After my debauchery with sweets, I was feeling mighty accomplished and went off to my next destination, Playa Bowls. Playa Bowls founder Abby Taylor said she realized that her hometown, the Jersey Shore, needed some of the bowls she’d tried on her travels surfing around the world. With over 30 locations and more coming, Abby admitted Instagram trends have a role in how they think about bowls, but the main goal is to have a product that tastes delicious. Later I crashed my boyfriend’s trivia night, and realized that pink food, in certain establishments, is difficult to come by. I settled for a glass of rosé and, when the team won the game (proof), we were gifted a bottle of Pink Party. This did not end well for me. Never try to quell hunger with sparkling rosé. Thursday, Day 3: Savory is how you will survive this. I woke up in a cold sweat and headed to Black Seed, where I ordered lox and tobiko cream cheese. The caviar from the tobiko turned the cream cheese bright pink and the combination with the smoked salmon made a sandwich that was almost too pretty to eat. While this is my go-to at Black Seed, for the first time I appreciated the color and the flavor. And the fact that I didn’t have to murder a beet to make a salty food item pink. Feeling revived from my savory lunch, I decided to visit the masterminds behind Soft Swerve. While they are known for their purple Ube cones, a purple yam from the Philippines, I was on the hunt for a Lychee cone. Unfortunately for pink week, this cone was out of season. I’d have to wait for the summer to get my millennial pink swerve on. I finished the day with a delicious tuna bowl with pink pickled onions at Flip Sigi, I felt a deep sense of relief that whatever caused the sharp stabby pains at the trivia bar the night before had completely subsided. I had a busy morning of meetings, so I attempted to make pink coffee with beets but only succeeded in creating a chunky beverage that wasn’t even vaguely pink. After scarfing down another slice of mermaid toast, I went to Chikarashi for lunch. Chef Michael Jong Lim dreams up these bowls based on his experience and knowledge of flavor combinations; the toro I loved on Instagram was simply a cut of tuna that’s closer to the belly, the fat content making it pinker. After my picture-perfect lunch, I wanted to take my immersion into all things pink to the next level. Having heard about color and Himalayan salt therapy, I decided to check it out for myself and booked a Crystal Light Bed, a Somadome, and a Salt Room Session at Modrn Sanctuary. Each therapy session focused on a red or pink light and during both my first sessions I passed out with positive, bright intentions manifesting my best pink life. The pink floor of Modrn Sanctuary. That night I went to grab dinner with my friends Ashwin and Laura, who were menu testing some items for their upcoming cafe, Nightshade. We were treated to a feast by Chef Allyx, who made us seared tuna with beet pearled couscous and roasted radishes with a grapefruit compote and lemon zest on a bed of radicchio. I didn’t share very much of this dish. Living la vie en rose, despite the sugar content, felt a little calorie-light for me. I like calories. I started the day with brunch at abcV, a vegetarian restaurant helmed by the talented Chef Neal. After Informing my servers I was only allowed to eat pink, they broke the bad news that the pink radicchio salad I came in to try was only on their dinner menu and recommended a few brunch dishes instead. They also warned me I had to save room for their most millennial option on the menu—a pink grapefruit gelée. I did not save room for dessert (you try to not inhale rhubarb pancakes), but not saving room has never stopped me before. I ordered the gelée and ate it. Je ne regrette rien. After having discovered pink radicchio through Marta’s Instagram, I’d been hunting for these pink lettuces since pink week started to no avail. I asked the team at abcV where they source theirs. They suggested Eataly’s produce section, where a floor manager informed me their next shipment would be coming in in a few hours. I would not be foiled this time and begged them to put aside a few bulbs for me when it arrived. I decided to wait out the radicchio delivery with another dose of sugar, so I went to Sweets by Chloe and tried their pink and black cookie, a spin on the New York classic. Triumphantly returning to Eataly, I purchased my pink radicchio and forced my boyfriend to take a picture with my new friends. To celebrate, I went to Sweethaus, a bakery that makes my favorite sugar cookies of all time and specializes in custom orders. Let’s say they went all out for pink week. I was starving at this point, so I opted to make something I’d been wanting to try all week—Macarosé and Cheese. I juiced a beet and added a teaspoon to about two cups of homemade bechamel sauce. After mixing in the macaroni and sharp cheddar cheese, I knew I had a winner. Sunday, Day 6: Frosting is not food. Marta, Akilah Hughes, and I decided to brunch at Carthage Must be Destroyed. What a Roman saying has to do with a millennial pink eatery in Bushwick I don’t know, but everything about this restaurant was the perfect shade of rose—from the industrial piping outside the building, to the plateware, to their ham. Too bad you aren’t allowed to take pictures, good thing we didn’t listen. I devoted the rest of the day to working and eating variations of pink radicchio (which, for the record, tastes exactly like regular radicchio but is 3x the price) and preparing myself for my last day of pink. I woke up to an avalanche of snow, but luckily I had a day of pink ahead of me. I stopped by Dominique Ansel Bakery to try my first cronut ever, which was Rhubarb Rose & Mascarpone flavored. I intended to only eat half, but scarfed the entire thing. To wash down the avalanche of sugar I’d just consumed I headed to Matcha Bar in Soho. Want to know what makes a matcha better? Rose syrup and whatever potpourri magic they sprinkled on top. For lunch I had my favorite salad in the city at Lighthouse Outpost. They pickle their own radishes, which made for a dish that almost let me forget it was rain-snow-slushing outside. Almost. To end my pink expedition, I went to De Maria for dinner, a hotspot in Nolita that’s known for its beautiful plating, some of which is very, very pink. After ordering two dishes served on millennial pink earthenware plates, I wondered if it would be gauche to draw inspo from their ceviche for festival flower crowns. Finishing my pink cocktail, I realized I’d done it: I’ve lived an entirely pink life for a week. But as I arrived triumphantly back at my apartment, I discovered Sugarfina had sent me all their pink treats and gummies in honor of pink week. As is only polite, I extended my rosé all day a little longer and ate the box. So what did I learn? Don’t judge a millennial pink awning by its cover. Restaurants go pink for all sorts of reasons, many of them having nothing to do with Instagrammability: cultural roots, ingredient seasonality or even simply making a statement in an incredibly competitive dining market. Immersing myself in pink also made me appreciate the lengths some stores went to to stand out from the concrete crowd. I’d notice the bright door frame someone painted, or an awning that’s the perfect and delicate balance of beige and pink. It’s unexpected. It took some effort. Sometimes it’s good to stop and smell the rosé.